Is there a way to duplicate or mirror a lesson into another course? Yes, you can duplicate or mirror any lesson or quiz you've created into another course. 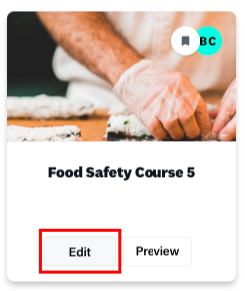 Step 1: Click the 'Edit' button on the course you want to duplicate or mirror your lesson into. Duplicating an existing module creates an exact copy of the module in your course. Editing this module won't effect the original. Note: Duplicating creates an unpublished copy. You must publish the module before it will be visible in your course. 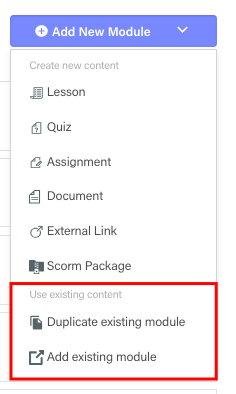 Adding an existing module makes a link to that module into your Course. Changes made to this module will be reflected across every instance of this module in every Course it is available in.